Much has been said about the perceived “homogenization” in executive compensation program design. The increased use of relative total shareholder return (TSR) for performance share unit plans – to 54% of the TSX 60 by 2014 – is a clear example. Similarly, stock option usage is somewhat in decline – down six percent among TSX 60 companies in 2014 (though still at 78% prevalence overall). Both of these trends are motivated at least in part by perceptions that relative TSR plans are shareholder-friendly and stock options are not. Where performance measurement is concerned, however, very little should be ruled off-limits until it has been considered in the context of the overall business strategy and plan. Understanding prevalent peer or general market practice is necessary, but not sufficient for choosing metrics and setting targets which should first and foremost be aligned with strategy and drive key business objectives. Companies create value when they find a way to grow – if that growth is profitable. 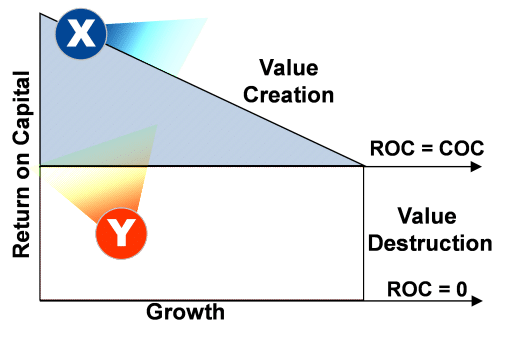 More specifically, companies create value when they grow while earning a return on capital in excess of the cost of capital – an economic profit. It is well-understood in financial theory that a company earning returns well in excess of its cost of capital will create more value by growing, even at lower marginal returns on capital. Growth should continue to the point that the marginal return on capital just offsets its cost – Company “X” in the diagram below. By contrast, a company that is not earning an economic profit – like Company “Y” – will create more value by focusing primarily on becoming more profitable, (often) even if that means selling assets and decreasing in size. 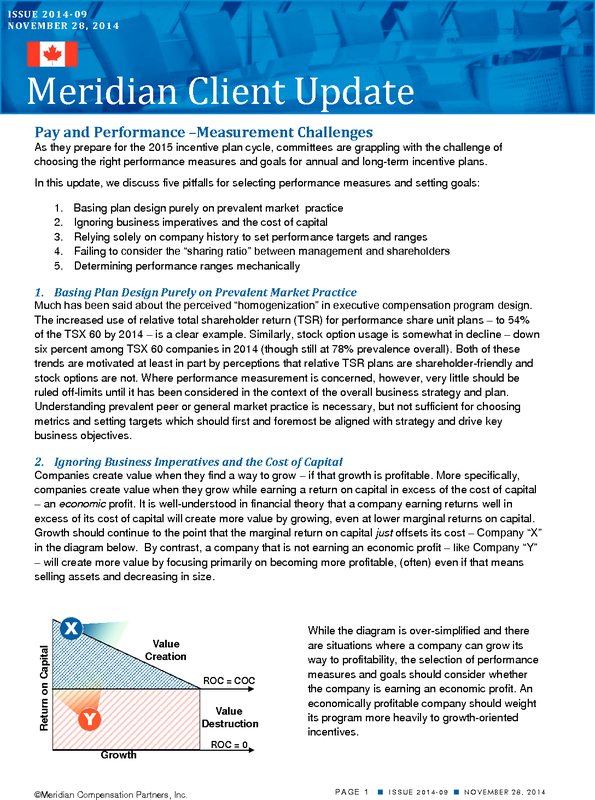 While the diagram is over-simplified and there are situations where a company can grow its way to profitability, the selection of performance measures and goals should consider whether the company is earning an economic profit. An economically profitable company should weight its program more heavily to growth-oriented incentives. Most companies base their incentive plan goals on the current-year budget or strategic plan. This means that the quality of decision-making for performance goals depends on the quality of the budget or plan, and the compensation committee’s understanding of its embedded assumptions. 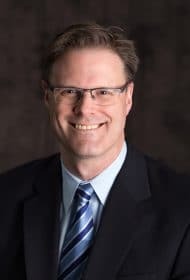 At the same time, the single greatest incentive compensation challenge for compensation committees is to rigorously review and approve goals that are sufficiently challenging and consistent with the company’s compensation philosophy. Modeling potential impacts to value (or to earnings) if goals are attained at various levels. These techniques can be used to test whether budget-based performance goals are reasonable and appropriate; others exist as well. Companies sometimes don’t consider how value created is shared between the company and its shareholders, and management, at different performance levels. Compensation committees sometimes avoid this analysis because there is little market data around the “right” level of sharing. But at a minimum, the company’s own trend in this sharing ratio (especially between the target and maximum payout levels) may provide valuable insights that may prompt further investigation and discussion. Performance plan targets (i.e., what is required to earn a payout at 100%) are commonly based on the budget, which makes sense, if the budget is set with reasonable stretch. Less attention is generally given to the performance required for threshold or maximum payouts (performance collars). There is a tendency to substitute rules for judgment in setting performance collars – most commonly the “80/120” rule, where performance at 80% of target justifies threshold payout and performance at 120% of target earns a maximum payout, with a straight-line performance/payout relationship between these boundaries. This classic form of performance/payout curve may often be suitable, but the key test ought to be the company’s assessment of likelihood of achievement at the various levels, and whether those likelihoods match with the company’s pay philosophy. Threshold performance is commonly supposed to be achievable 80% to 90% of the time, and maximum performance 10% to 20% of the time. On a measure with a high level of controllability the performance collars may be quite narrow and payout curves may be asymmetrical to achieve the appropriate levels of stretch. By contrast, during periods of rapid growth or financial uncertainty, the ranges might be wider and curves shaped differently. Meridian comment. The 2014 proxy season signaled an increased focus on performance measures and goal setting by both shareholders and proxy advisors (ISS and Glass Lewis). This focus is likely to continue. Unlike governance focused changes in executive compensation, incentive compensation arrangements cannot be fixed and forgotten, measure selection and target-setting needs to be discussed for each new performance cycle, in light of market and company performance. A thoughtful and rigorous program of analysis can help compensation committees to be comfortable that the measures and goals are the right ones.